Customer Support Desk Software, customer service software self help. sitewebdesk integrates with the following products. Hardware and Application Inventory monitoring. 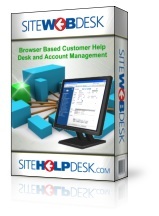 sitewebdesk is available for download from this site or ask us about hosting it for you. Designed to provide 24 x 7 web based customer self help, sales and support to improve your online services and reduce the burden on your technical and sales resources. Follow the review of sitehelpdesk core features and then review the following additional benefits of the sitewebdesk Customer Support and Relationship Management software system. Why pay for expensive WEB developments when a customer service software application exists that can provide the Customer Support and Relationship Management functionality you require. Hosting options available or run from your own server or with your chosen ISP. Easily configurable colours, fonts and style. Shared Open source code means your own web developers will have full access to our source code to add logos and images as well as additonal features, and fully integrate sitewebdesk with your corporate web site. Integrate customer registrations from your own site via your own downloads or purchasing forms. Integrates with WMImonitor for web browser based Hardware and Software Inventory auditing and physical configuration change control. Identify and report on customer hierarchies with Head Office and Branch type relationship links. Set up a link on your web site for secure access by your customers into your sitewebdesk online customer support desk. Keep your Customers up to date with product and service issues and latest news and give them a reason to come back to your web site again and again with personalised support responses and product news. Call logging, tracking, FAQ, self help and other optional features consistent with sitehelpdesk. Facility to identify products or services and inventory items during call logging. Options to provide other web links to useful resources promotions etc. Option to provide customer feedback form and customer satisfaction surveys. Your Account Managers will have instant access to their customer details at any time from any where with internet access to help you improve your customer service. Identify key Contacts and their details and track communications. Attach related documentation such as customer service contracts or quotations. Manage scheduled task and diarised events. Track customer status from Lead, Prospect to Sale. SLA contract profiling, reporting and time / expense and materials billing. Automated call routing and customer related enquiries. Set up your products or services and assign to customers. Manage changes to products through Change and Release Management facilities. Optionally utilise the Inventory and Stock management features consistent with sitehelpdesk-IT. Automated allocation of online tickets raised by customers based on type of problem or to the customer's designated support manager or Team. Rapid call entry by operators from two way email links or telephone calls received . Rapid customer search and selection and auto population of associated fields when generating a customer support call ticket. Optional New customer and contact entry facility during call ticket entry. Definable fields, Scripting and tasks may be applied to prompt the Operator to gather relevant information or promote relevant products or services and make sure things get done the way they should for full customer satifaction. All the features of sitehelpdesk are available for Call Management with Knowledge Management, Events, Follow ups, Templates, Attachments, time Sheet recording and billing etc. Email notifications and remote access via smartphones. Allowing access to the latest customer information to the sales and support team in the field. Remote updates, contacts, customer events, downloads of orders, contracts and much more. Now you have seen the highlights - click here to download a free trial of sitewebdesk or email a sales representative to arrange a demonstration or to discuss your requirements further. Click a screen image below for more detail.